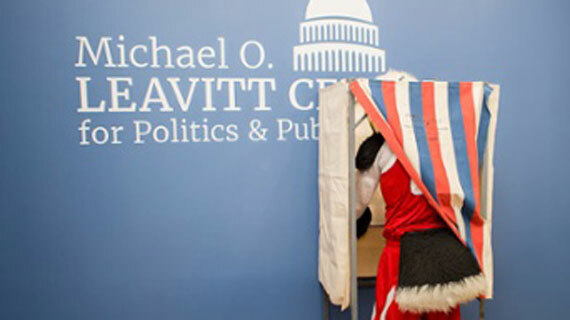 The Michael O. Leavitt Center for Politics and Public Service (Leavitt Center) is hosting a Voter Registration Drive for National Voter Registration Day. The drive will take place on Tuesday, September 25, on the campus of Southern Utah University. The student leaders are working to reach as many corners of campus as possible, with drive efforts being led by Leavitt Center students. The drive will focus on voter registration, but changes in ballot information and absentee ballots can also be requested. “Voter registration efforts are important, especially on college campuses, because a lot of students aren’t registered or politically active but their voices still matter,” said Morgan Barney, senior Spanish major and Executive Council member in the Leavitt Center. This year, voter registration efforts are even more important as Lieutenant Governor Spencer Cox has added a competition to the movement. The Campus Cup is a statewide voter challenge sponsored by the Utah Lieutenant Governor’s Office. Universities and colleges compete for ownership of the trophy, bragging rights, and a meeting with LG Cox. Schools participate through registering students to vote, using the school’s designated hashtag on social media, and having an interactive component in the competition. Those wanting to earn points for SUU can register at the link or post on social media with #SUUvotes. For more information on the Campus Cup, Voter Registration Drive, or other Leavitt Center activities, email leavittcenter@suu.edu or call 435-586-7868.